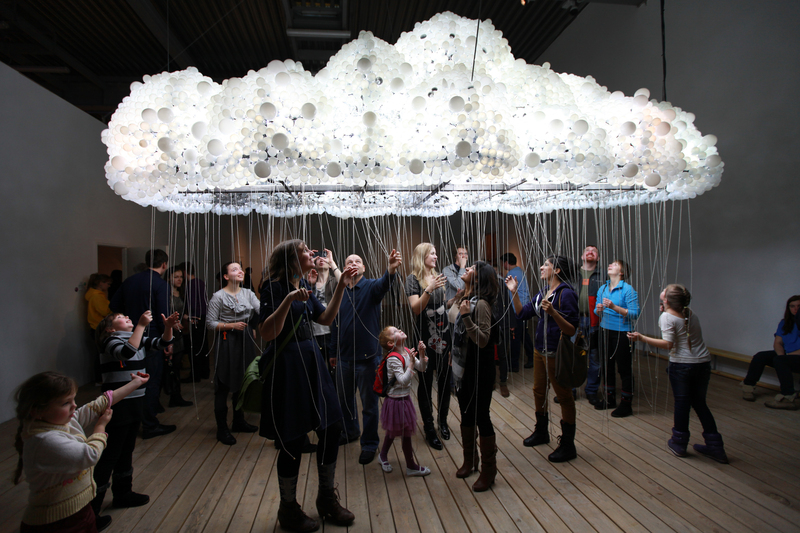 CLOUD is an interactive sculpture created from 6,000 incandescent light bulbs by Canadian artists Caitlind r.c. Brown & Wayne Garrett. The piece utilizes pull chain switches and everyday domestic light bulbs, re-imagining their potential to catalyze collaborative moments and create an enveloping, experiential environment. 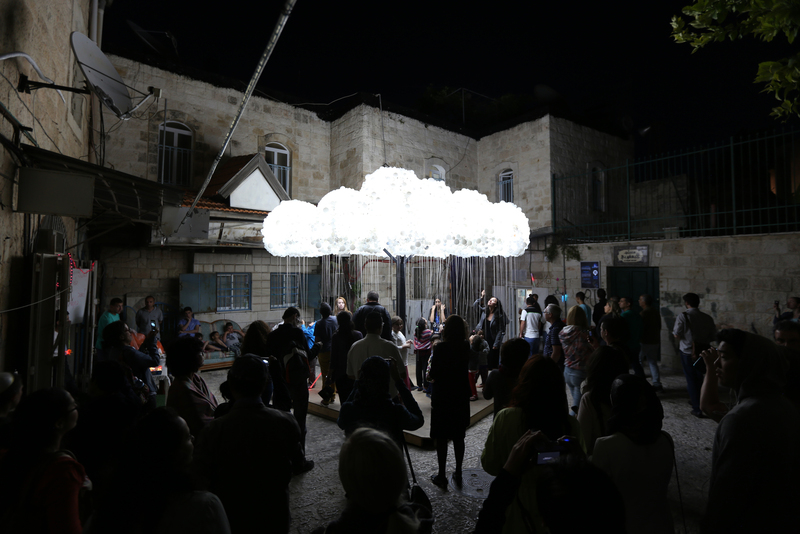 During exhibition, viewers interact with CLOUD by initiating impromptu collaborations, working as a collective to animate “lightning” on the surface of the sculpture. 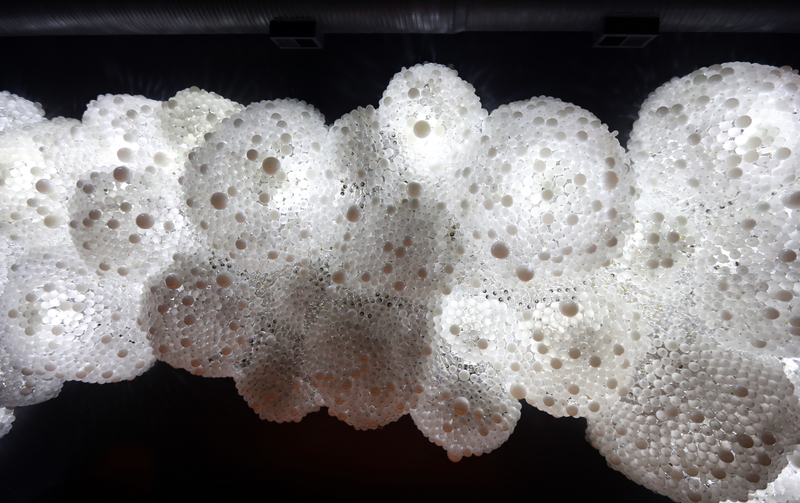 As viewers move beneath the canopy of light bulbs, CLOUD reveals its substructure – its underbelly is industrial and utilitarian, built from structural beams, exposed electronics, and imperfect, hand-bent steel. This “reveal” breaks the illusion of delicacy and lightness characterized by the outside aesthetic of the artwork. Similarly, participating viewers realize that the surface of incandescent light bulbs is only a diffusion layer, filtering bright white light from LED bulbs beneath. The materiality of CLOUD speaks to a broader conversation about domestic waste and the mass of insignificant objects in urban spaces. 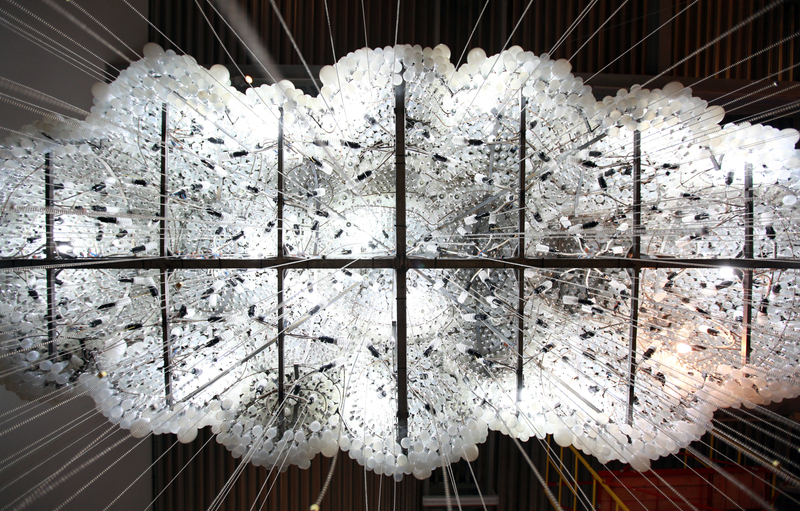 As incandescent bulbs are phased out in the European Union and various countries around the world, the sculpture gains new meaning as a beacon of transitional technologies and changing futures – where are we going next? Simple, bright, and playful, CLOUD is a barometer of social interaction, collaboration, and collective action, reflecting a whole that is greater than the sum of its parts. As viewers engage with pull chains, they become unwitting performers and puppeteers, orchestrating an uncertain spectacle for viewers outside the work. Subsequently the “inner” and “outer” spheres of the artwork pose different dynamics, inviting both participation and contemplation, spectacle and speculation, collective and subjective, harmony and chaos. Characterized by upturned faces and glittering eyes, viewers engage with the work long after all its secrets have been revealed. 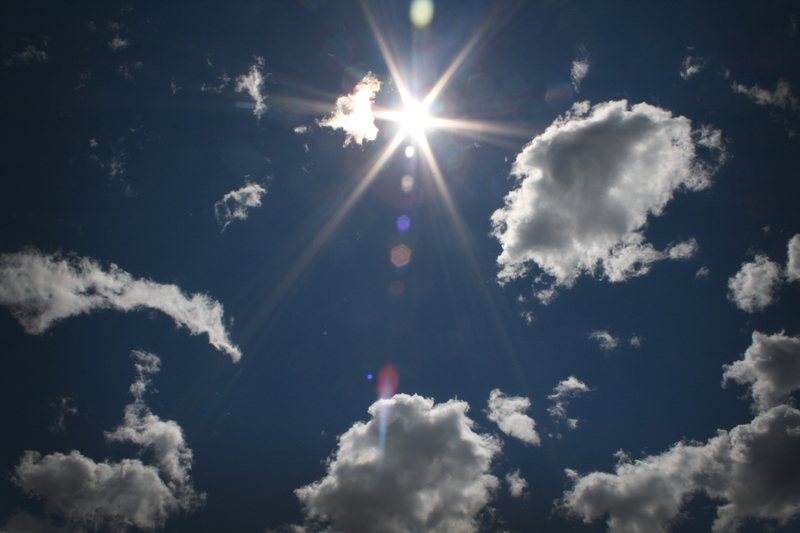 On a symbolic level, CLOUD relies on the universal language of environmental imagery – despite language barriers, cultural differences, and geographic distance, rain clouds are understood by people all around the world. 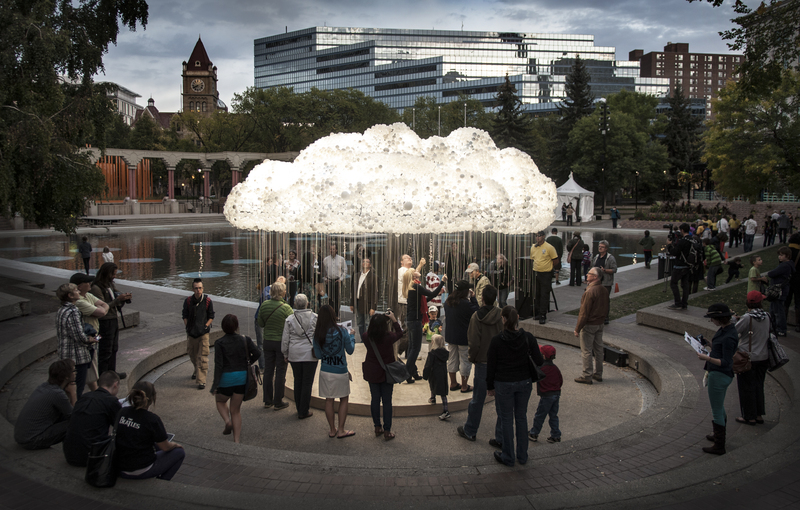 The first edition of CLOUD was commissioned for Nuit Blanche Calgary in 2012. A second edition was commissioned by Garage Museum of Contemporary Art for Art Experiment 2013 (Moscow). 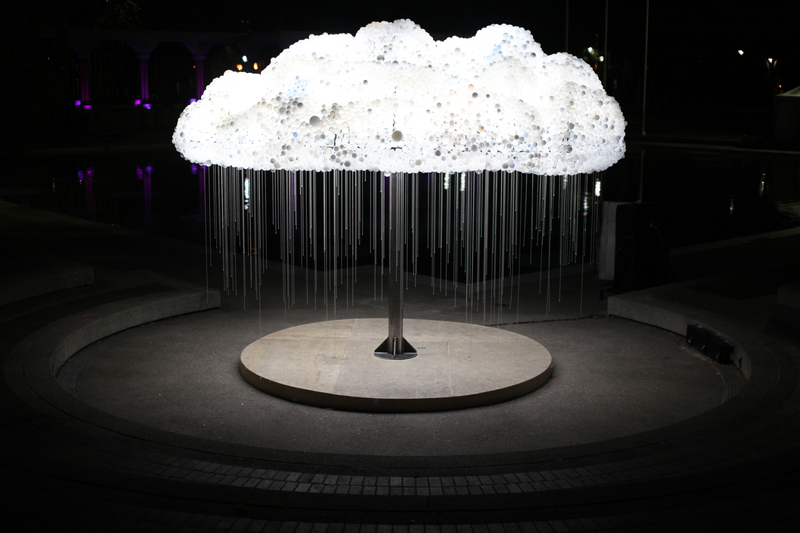 The first edition of CLOUD was first created for Nuit Blanche Calgary (Canada) in September 2012. In early 2013, the artists built a second edition of the sculpture in Russia with assistance from Garage Center for Contemporary Culture as the centerpiece for Art Experiment 2013 (Moscow). 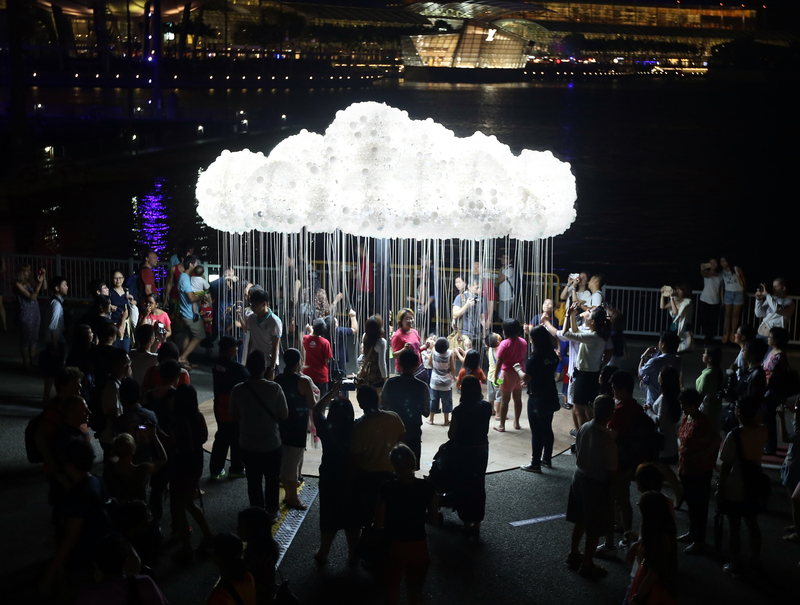 In 2013, CLOUD was short-listed for an Innovation by Design Award in New York City. 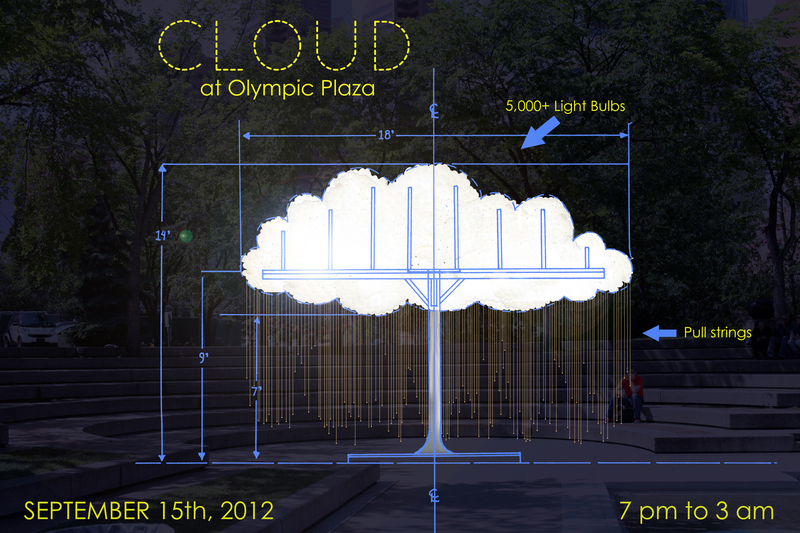 Sponsors of the FIRST EDITION of CLOUD: Alberta College of Art + Design, The Nuit Blanche Foundation, The City of Calgary, Calgary Arts Development Authority, Calgary Public Arts, Calgary 2012, and The Awesome Foundation (Calgary chapter). Sponsors of the SECOND EDITION of CLOUD: Garage Center for Contemporary Culture and Alberta Foundation for the Arts. Thank you to Alberta College of Arts + Design and Wayne Baerwaldt or ongoing support. 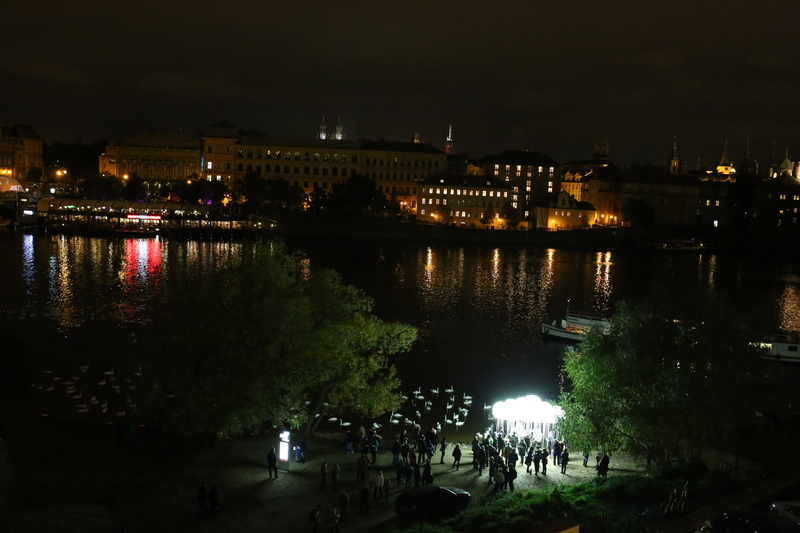 Sponsors of the THIRD EDITION of CLOUD: Signal Festival in Prague, Czech Republic. Commissioner of CLOUD CEILING: Progress Bar, Chicago. Thank you to the amazing Progress Bar team for entertainment, many hands, and amazing donuts! 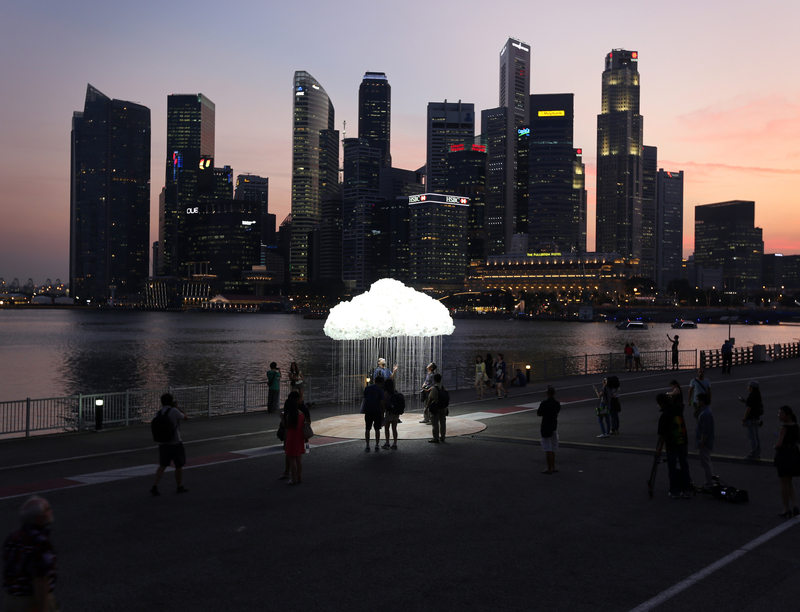 In a similar vein, the artists designed and installed a permanent cloud-form installation in June 2013 in Chicago, USA. 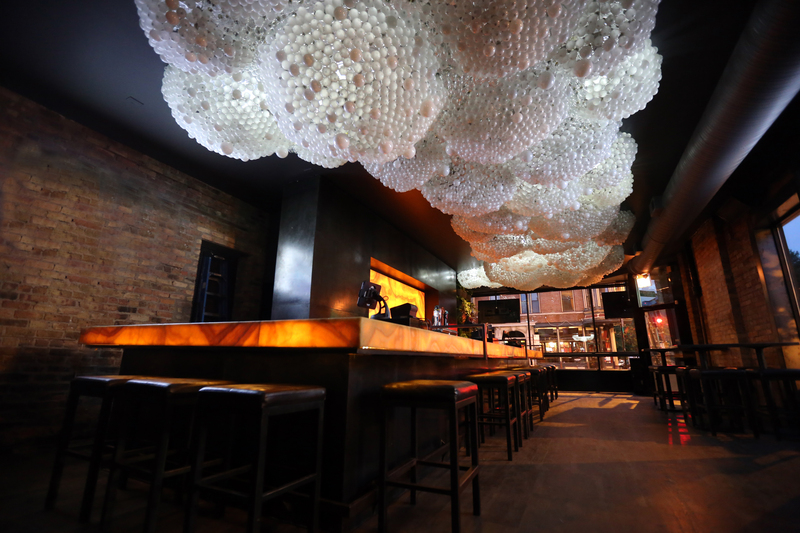 Entitled CLOUD CEILING, this rendition is installed in Progress Bar and utilizes motion sensors and over 15,000 light bulbs.